A USER INTERFACE DESIGNED AROUND USER-FRIENDLINESS WITH EXTRA FEATURES THAT ARE NOT INCLUDED IN THE STANDARD UI. Copyright ©2009-2019	The contents of this addon, excluding third-party resources, are copyrighted to their authors with all rights reserved. 1. You may make modifications to this addon for private use only, you may not publicize any portion of this addon. The only exception being you may upload to the tukui.org or github website. 2. Do not modify the name of this addon, including the addon folders. 3. This copyright notice shall be included in all copies or substantial portions of the Software. All rights not explicitly addressed in this license are reserved by the copyright holders. You can write to us at contact@tukui.org for reporting abuse. The current version of ElvUI is 11.10 and was updated on 2019-04-10. Fixed Keybind Mode (/kb) to once again work on Stance and Pet buttons. Recoded some of the charge cooldown stuff (again!) This should fix Blade Flurry. Disabled Actionbar Charge Cooldown Text by default. Unsnapped the Totem Bar icon textures. Fixed Actionbar Masque enabled error "attempt to index field 'pushed' (a nil value)". [Actionbar] Reworked the Show Charge Cooldown a bit so that it won't stack two texts on certain spells. [Actionbar] Refixed the Desaturation option so that it will recolor as soon as the cooldown finishes. [Actionbar] Fixed the pushed texture getting stuck on some buttons. [Nameplate] Name Only ending was preventing the Target Class Power from displaying correctly. [Nameplate] Option for Target xOffset for Stagger and made sure Stagger bar disables correctly when it should. [Nameplate] Corrected the Swap to Alt Power setting. [Nameplate] Made sure Target Class Power gets updated correctly. [Nameplate] Added ElvUIPlayerNamePlateAnchor for WeakAuras and other AddOns. [Nameplate] Added an option to toggle the Nameplates from fading in when shown. [Nameplate / Unitframes] Added NamePlate and UnitFrame Color Selection colors from oUF. (Thanks oUF/LS-)! [Nameplate / Unitframes] Added a new smoothing method to Unitframes and Nameplates. (Thanks LS-)! [Nameplate: Style Filter] Add a new Filter: "Explosives" for Explosive Orbs in Mythic plus. [Nameplate: Style Filter] Added trigger Creature Type. [Nameplate: Style Filter] Added trigger if the unit is Focused (or not). [Unitframe] Added Duration option for cooldown text and reworked the cooldown code. [Chat] Added options to Desaturate, Pin to Tab Panel, or Hide Voice Buttons. Added an option to ignore the UI Scale popup when resizing the game window (General -> Ignore UI Scale Popup). [Nameplate] Fixed an issue which caused the Targeted and Player Classbar options to not take effect correctly. [Nameplate: Style Filter] Made Name Color and Alpha action work again. [Nameplate: Style Filter] Fixed Health Color not working correctly in combat. [Nameplate: Style Filter] Fixed PVP Talent triggers. [Nameplate: Style Filter] Fixed Castbar Interruptible triggers. [Nameplate: Style Filter] Optimized the Name/NPC ID trigger, reaction, classification triggers. [Nameplate] Fixed a gap at the end of Classbar on Nameplates. [Nameplate] Fixed Power Hide when Empty. [Nameplate] Fixed a bug where the Highlight was under the health. [Nameplate] Fixing Off Tank Color on Nameplates and added transitioning colors. [Nameplate] Made sure the Classbar appears on the Targeted plate correctly. [Nameplate] Fixed issue which prevented the Quest Icon from showing in some cases. [Nameplate] Fixed rune sort order for Deathknights and Classbar color for Monks. [Actionbar] Fixed main bar (bar one) paging issue. [Unitframe] Fixed health not updating correctly (again). [Unitframe] Fixed Castbar hold time not working correctly. [Chat / Datatext] Finally fixed the 'lhs' error with Quick Join. [Chat] Fixed an issue which was caused from our Chat file skinning the Combat Log bar when other addons hid it. [Datatext] Made sure the LDB Datatext value color updates along with the General Media Value color correctly. Fixed an issue which prevented border and backdrop color from being updated correctly in some cases. Fixed spam errors when trying to change Talents when you have non selected yet. Fixed an issue whiched caused incompatiblity with our config and ColorPickerPlus. Fixed an error in init.lua: attempt to index local 'ACD'. Fixed an issue with the Quest Skin which caused the Quest Icon beside the text to sometimes not be shown. Fixed the DropDown Box text on the Communities Stream Dropdown. Fixed a tiny visual glitch with the DropDown in the Communities frame. Fixed an issue which would cause an error if you had the Login messaged enable while the Chat module was disabled. Fixed an issue which prevented Aurabars from correctly handling the Dispellable filters. Fixed an issue with the cooldown module which wouldn't correctly set cooldowns when they were started cooldown before you logged into the game. [Nameplate: Style Filter] Enabled Hide Frame action. [Nameplate + Style Filter] Adding Name Only (with Show Title). [Nameplate] Keep Player nameplate from fading out. [Nameplate] Reallowed Target and Threat Scale in options. [Nameplate] Removed Detection as this was used in Legion but is no longer used as much and this would increase preformance further. [Nameplate] Readded the Visbility settings on Static Player. [Nameplate] Reworked the cooldown text, so that it matches Unitframes. [Nameplate] Reworked the Target Alpha so that it shows only while in combat. [Nameplate] Updated oUF to increase preformance of the new Nameplates further. [Nameplate] Added backdrop coloring to the classbars. [Nameplate] Health Prediction defaulted to off except for Player. [Nameplate] Added xOffsets on Buffs, Debuffs, Castbar, Class Power, and Power bars. [Unitframe] Cleaned some of the Castbar code, as we believe this is part of the reason for the Unitframes to cause additional lags. [Actionbar] Stopped allowing Keybinder in combat. [Bag] Recoded the animation for the New Item Glow so they all glow together instead of seperately, also gave it a fancy new glow texture. [Bag] Added the Deposit Reagents button to the Bank Tab too. [Config] Made the Enable Checkboxes in the config colorful, so that they're easier to spot, plus it looks really cool, imo. [Config] Oganized a bit with help from (@wing5wong). Updated Module Copy to handle some new cases. Updated Quest Greeting Frame skin. Optimized the Color Picker code for better preformance, also it will accept three digit hex values in the hex box but you must you press enter. Skinned the New Toy Alert. Skinned the Communities Notification Buttons. Removed the 'Forcing MaxGroups to' message. Added smoothing option to the Alternative Power bar. Blizzard corrected the issue with CVars not saving correctly. Adjusted all the Power and Classbar backdrop colors to be a little more vivid. Actually let the Target Class Bar on Nameplates use Class Color for classes other than Death Knight. Fixed an issue which made backdrops always appear. Fixed another case when C-Stack errors could occur from the Toolkit. Fixed an issue which caused clicking problems in the middle of the screen. Fixed LFG Ready Popup skin from showing a Blizzard backdrop. Allowed the Config to once again leave the screen. Fixed the C-Stack error (for real). Fixed issue which caused the chat panel backdrops color to change when updating the normal backdrop color setting. Attempted to fix a C-Stack error from `Core/Toolkit`. Fixed an issue which caused a hidden frame in the middle of the screen to hijack clicks. Added Target Class Bar on Nameplates. Added Class Color option for Target Class Bar, Player Class Bar, and Nameplate Power Bars. Fixed the textures on the Stance bar. Fixed Masque support for Pet bar and Stance bar. Fixed the Class Media Value Color from not using the class color on different classes as it should! Fixed Style Filter for Health Color changing to black when the filter ends. Fixed issue which caused the Script Profile Popup to be shown twice. Fixed TargetIndicator glow change the color correctly after switching targets. Fixed issue which caused the Action bar buttons to not set the "checked" state. Fixed an issue which caused the Blizzard Castbar to sometimes not be shown when the UnitFrame module was disabled and disable Blizzard Player Frame was unchecked. Fixed an issue which caused the UI to hide (like Alt-Z) when opening the Bank frame using the non-thin border theme. Prevented the Update Popup from being shown while in combat. Added `Dispellable` to Nameplate Friendly NPC Buffs and Nameplate Enemy Player Debuffs list by default. Fixed issue where opening the bank with shift would say you needed to purchase the reagent slots. Fixed issue on pet bar which may have caused the "auto cast" markers to show in the wrong pet spells. Fixed error in the config caused from the Nameplate Threat. Fixed visual issue where the voice channel icon would show on the chat panel even though it was hidden causing it to appear out of place. Fixed Blizzard Castbar being disabled when Unitframe module was disabled. Fixed Pet bar issue which sometimes could error about `pushed`. Allowed Test Nameplate to be movable via drag. Fixed pet bar not displaying the spell textures correctly. This release resets the nameplate settings in order to transition to the new nameplates. Make sure you check out the post in the news section for the details! NamePlates were rewritten from scratch. They now utilize the oUF framework like our UnitFrames. Keep in mind that parts of the new nameplates are still being worked on. Fixed our SetTemplate function, which now should finally deal with all (maybe =)) Border issue regarding the Pixel Changes introduced with 8.1. We now only use one Font option for the Character-/Inspect Feature. Put the Voice Chat Buttons in our Left Chat. Now its more intuitive to find it. This release contains a warning popup which informs the user that nameplates will be reset when ElvUI v11 is released with patch 8.1.5 on March 12th. Added option to suppress the "UI Scale Changed" popup for the current session. It is a checkbox on the popup itself. Fixed visibility of raid frames in the installer for the healer layout. Added warning popup with information about nameplates getting reset with patch 8.1.5. Added hard cap on min/max values for UI Scale setting. Added hard cap on max value for general font size setting. Added support for checkboxes on our static popups. Reverted some of the recent UI scale changes in an attempt to make it work correctly for more people. Fixed issue with Objective Tracker in Mythics. Fixed issue causing UIScale value to be stored as string instead of number, resulting in an error in v10.89. Changed UIScale information popup so it will continue to pop up until an action has been taken. This is to make sure the user sees the info in case an error prevented the popup the first time. Added options to change font, size and outline on the new itemlevel and enchant info on Character/Inspect frame. Fixed an error in the archeology skin. Fixed incompatibility issue(s) with Kaliel's Tracker due to a moved reference to E.Blizzard. Fixed rare issue where UIScale had been stored as 0 and would cause the UI to explode. 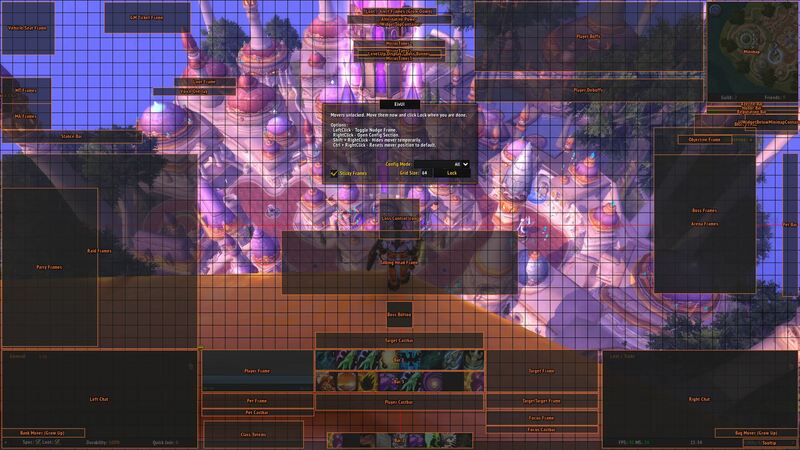 With this release we have changed how we handle UI scale in ElvUI. As a result we no longer set, or rely on, the CVar for UI scale. Because of this your UI scale has to be set again when you first log in with this new version. We have done our best to make it a graceful transition, and as such you will be presented with a popup on your first log-in, where you can see what your old CVar value was, and choose to use this value. You can also choose to have a UI scale calculated for you, or simply set it manually in the config. From now on you can choose your UI scale within the ElvUI config, or press the "Auto Scale" button to use the value that was previously considered most optimal for your resolution. Added BoE/BoA text overlay in our Bag/Bank. Added optional mount name for units on tooltips. Added a new option to display Inspect Info on the Inspect and Character frames. Added option to toggle Objective Tracker when boss or arena frames are shown. Fixed taint in CommunitiesUI preventing you from setting notes among other things. Workaround by foxlit. Various Skin updates for performance and prettyness. The layout in the installer has been replaced with a new one. Fixed a bag config error if the bag module was disabled. Fixed an error caused by incorrect file loading order. Added option to toggle on/off the colors on bag slots for bags with assigned items. Added option to use the Blizzard cleanup method instead of the ElvUI sorting. Added a way to assign types of items to certain bags by right-clicking the bag icon in ElvUI. Added a count of remaining available characters to the chat editbox. Added the source text for mounts in the tooltip. Added Blizzards way to highlight scrappable items if the Scrapping Machine Frame is open. Fixed issue which caused E:UpdateAll to be called twice, potentially causing errors in plugins. Added terrible workaround for the broken events that cause health updates to break down. Added a compatibility check for our Garrison Mission skin, if GarrisonMissionManger is loaded. Updated gold datatext. Added an indicator for the current character and characters are now in class color. Consumable items that disappear when logged out are now sorted last to avoid gaps in the ElvUI bags. Added a search filter for Mythic Keystone to LibItemSearch. You can search for keystones or ignore them from sorting with the term "keystone". Moved the options for the Talking Head to the skin section. Added Battle of Dazar'alor raid and M+ Season 2 affix debuffs to the RaidDebuffs filter. Added `Weakened Soul` back to our Buff Indicator. Added new Currencies to our Currencies Datatext. Added NamePlate classbar scale option. Added color options for UnitFrame Power Predictions. Fixed a possible nil error on our NamePlate auras. Fixed nil error in the Obliterum & PvP skin. Fixed an issue in Bags skin preventing the "highlight" visual from showing when searching for items. Fixed an issue which could result in Quest Icon not showing up on nameplates even if it was enabled. Fixed an issue that we accidentally use the general texture for the UnitFrame backdrop instead of the UnitFrame texture. Fixed Copy Chat Log (and Copy Chat Line) from displaying lines sometimes. Fixed minor positioning issue with role indicator on unitframes. Fixed issue which caused NamePlate StyleFilter NameOnly option to misplace the ClassBar/Portrait on plates. Fixed issue with ClassBar on NamePlates since 8.1 patch, the ClassBar also correctly works on Druids now. Fixed issue with NamePlates glow beeing pixelated. Fixed Social Queue Datatext and Chat Message. Fixed an issue that mostly affected actionbars, where elements would be misplaced after a profile change. Changed Health Backdrop Multiplier to be an Override instead. Updated oUF tags with recent changes. Hid the Recipient Portrait on the TradeFrame. ElvUI now staggers the updates that happen when a profile is changed. This should have minimal effect on existing plugins. Added option to use health texture also on the backdrop. Added a position option (Left or Right) for the Quest Icon on the Nameplates. Added option to show an icon on an item in the bags if it's scrappable. Added option in our media section to remove the cropping from icons. Mostly used for Custom Texture Packs. Added option in our media section to select the 'Font Outline'. Added the WoW Token price in our Gold DataText. Fixed QuestGreetingPanel & WorldMap skin not take account to Parchment Remover. Updated LibItemSearch to latest version. Updated the Ace3 (ElvUI config) checkbox skin to a permanent color. Added Drain Life to channel ticks. Added Island Expedition progress to the BfA Mission Datatext. Added NPC Id's to our Tooltip. Added Debuff Highlighting on our Focus Frame. Added a Module Copy option. This allows you to copy module settings to/from your different profiles. Added "Display Interrupt Source" to NamePlate castbars. Added Color options to the UnitFrames to choose the Blizzard Selection Colors. Added NamePlate indicators for Quest Mobs. Works only in the Open World. Added a skin option to remove the Parchment from some skins. Fixed display castbar for Arena & Boss Frames. Fixed issue which would sometimes keep Player UnitFrame out of range. Fixed issue which prevented Style Filters from applying to Healthbars of some Nameplates when Healthbar was disabled. Updated the macro text on the ActionBars to use the ActionBar font. Optimized Bag Code in various areas. (This should mainly fix the lag reported when opening your bags). Removed ArtifactBar from the DataBars. Reworked vendor greys code to resolve issues with the previous versions. Updated collection skin. Credits AddOnSkins. Added `ElvUIGVC` chat channel for Version Checking (AddOn Communication) and Voice Chat (off by Default) on realm. Added an option to hide the honor databar below max level. Disabled by default. Fixed a rare nil error in the range code. Added Infested affix buff to RaidBuffsElvUI filter. Updated ArenaPrepFrame functions (Thanks oUF!). Updated PvP, LFG & Talent skins. Fixed issue with display of Attonement in Buff Indicators when the Trinity talent is active (#346). Fixed issue with "out of range" display on UnitFrames on the Mother encounter in Uldir (#767). Added BfA Dungeon debuffs to RaidDebuff filter. Credit: Dharwin & Rubgrsch. Removed T-18 4 PC Bonus from the Druid Buff Indicator. Added toggle option for Cutaway health on Nameplates. Added dedicated backdrop color option to chat panels. Added backdrop color option to Chat Panels. Added Seafarer's Dubloon to the Currency Datatext. Added Strata option for the Bags. Added a temp mover for the Scrapping Machine Frame. Fixed Nameplate Cutaway health not following Style Filter Health Color changes. Fixed the AltPowerBar enable toggle not requiring a reload. Fixed Blizzard Forbidden Nameplates not spawning in the world when Nameplate module was enabled. Fixed the default position for the UIWidgetTopCenter mover. Fixed issue with chat frames and data panels disappearing (#686). Fixed statusbars on the ToyBox & Heirloom tab in the collection skin. Fixed issue which prevented debuff highlight from working for shadow priests and diseases. Fixed CVar `chatClassColorOverride` not working correctly. Fixed errors which occurred in `OrderHallTalentFrame` and `Contribution` skins. Fixed bags not properly showing items when searched. Fixed an issue that sometimes the chat scrollBars where not hidden properly. Re-enable the old Guild skin back. Updated Communities, PVP & Tooltip skins. Added a mover for the Chat buttons. Fixed issue which caused community chats to be shown in all chat frames. Updated `Setup Chat` part of installer to enable class colors in all channels and communities. Added support for chat filters for community channels displayed in the real chat window. Fixed issue with backdrop on tooltips turning blue. Fixed error when pressing 'Enter' to start typing in the chat (#485). Added skins from Simpy for Artifact Appearance and Orderhall Talents. Added support for Load On Demand addons' memory/cpu usage display in tooltips (credit: cqwrteur). Fixed a texture issue in the Quest Log skin. Updated skinning of the 'TodayFrame' in the calendar. It uses skinning from Azilroka. New Cooldown settings, they can be found in the Cooldowns category or by typing `/ec cooldown`. Added Death Knight Rune sorting option under `/ec - Player Frame - Classbar - Sort Direction`. Added new Azerite DataBar (replaces Artifact DataBar). Added button size and spacing options to the Micro Bar. Added scale option for the smaller world map. Added new skins for the new elements in patch 8.0. Added the original chat buttons to a dedicated panel which can be toggled by right-clicking the "<" character in the left chat panel. Fixed issue with UnitFrame Mouseglow when Portraits was enabled in non-overlay mode. Fixed error when attempting to right click a fake unitframe spawned from "Display Frames" by unregistering mouse on these frames. Fixed issue with Guild Bank which sometimes prevented icons from being desaturated during a search while swapping between bank tabs. This also corrects the strange delay it appeared to have. Fixed issue which caused chat emojis to hijack hyperlinks. Fixed icon border on black market auction house items. Fixed `[namecolor]` not updating sometimes when it should. Fixed skin issue when using a dropdown in the config. Fixed friendly nameplates not showing in Garrisons. Fixed issue with tooltip compare being activated when it should not (#471). Fixed several issues with the Micro Bar. Fixed error in the Spellbook relating to our Vehicle Button on the minimap and position of the Minimap (#434). Fixed various issues with tooltips (#472). In order to improve load times, ElvUI will no longer load `Blizzard_DebugTools`. Reworked the Talent frame skin slightly, in order to improve determination of selected talents. Changed how icons get shadowed in Guild bank and Bags module. Added "Group Spacing" option to party/raid frames. This allows you to separate each individual group. Added option to move the Resurrect Icon on the party/raid/raid40 frames. Added new UnitFrame Glow settings located under `UnitFrame -> General -> Frame Glow`. Each type of UnitFrame (Player, Target, Etc) has new options to disable these settings individually. Added an option `Nameplates -> General -> Name Colored Glow` to use the Nameplate Name Color for the Name Glow instead of Glow Color. Added options to override the Cooldown Text settings inside of `Bags`, `NamePlates`, `UnitFrames`, and `Buffs and Debuffs`. Fixed instance group size for Seething Shore and Arathi Blizzard. Fixed issue that prevented the Guild MOTD from being shown in the chat after a `/reload` sometimes. Fixed issue that prevented the Loot Spec icon on BonusRollFrame from showing correctly after changing specs. Fixed issue which could cause an error in other addons when Chat History was enabled. Fixed issue with range checking on retribution paladins below lvl 78. Until lvl 12 the range will only be melee, then you get Hand of Reckoning which we can use to check range. Fixed issue preventing the stance bar buttons to be keybound. Fixed tooltips getting skinned while Tooltip Skin option is disabled. Fixed issue which prevented a dropdown from being shown in the world map. Fixed an error regarding LeaveVehicleButton in battlegrounds. Fixed a typo in datatexts which could prevent LDB data texts from loading when entering world. Fixed issue which prevented the "new item" glow from hiding on items in bag 0 when closing bags. Fixed various issues with the Targeted Glows on NamePlates. Fixed issue which made the Friendly Blizzard plates wider than they should be for some users. Fixed issue which may have caused the Nameplate Clickable range to be off more than it should. Fixed issue which prevented nameplate glow from wrapping around the enemy castbars. The Plugin Installer frame is now movable. The Chat Module now supports Custom Class Colors a little better now. Chat History will now highlight keywords, allow linking of URLs, and will no longer populate Last Tell for replies. Reworked the Equipment Flyout skin. Unitframe tags will now return nil instead of an empty string when there is nothing to show. Made it more clear that the "vendor greys" button also deletes items when not at vendor. Resetting a UnitFrame to default will now show a popup confirmation upon clicking the reset button. Nameplate NPC Title Text will now show the glow color on mouseover when it's the only thing shown on the nameplate (health and name disabled with show npc titles turned on). E:ShortValue will now floor values below 1000. Optimized nameplates a bit, by making sure updates on Blizzard plates would not continue firing after we replaced them with our own. Added color options for Debuff Highlighting. Added option to Enable/Disable individual Custom Texts. Added individual font size options to duration and count text on Buffs and Debuffs (the ones near the minimap). Added spacing option to unitframe Aura Bars. Added an option to show the unit name on the chatbubbles. Added option to use BattleTag instead of Real ID names in chat. Added option to use a vertical classbar on unitframes. Added spacing option for classbar on unitframes. It controls the spacing between each "button" when using the "Spaced" fill. Added an option for a detailed report for Vendor Grey Items. Added Talent Spec Icon on the tooltip. Fixed issue that would allow quest grey items to be vendored via Vendor Grey Items. Fixed rare tooltip error (attempt to index local 'color'). Fixed error trying to copy settings between nameplate units (#305). Fixed various issues with the keybind feature (/kb). Trying to keybind an empty pet action button will now correctly show a tooltip. Trying to keybind a flyout menu will now correctly show a tooltip too. Clicking on a player's name who whispered you or messaged into guild chat via Mobile app will now properly link their name with realm attached. Corrected issue which made the UI Scale incorrect after alt-tab during combat when using Fullscreen on higher resolutions. (This will now autocorrect itself after combat ends). Fixed UI-Scale bug for users over 1080p in Fullscreen mode. (Thanks AcidWeb and Nihilith for helping debug). Fixed UI-Scale being off for Mac users as well. (Thank you critklepka for helping debug the Mac scale issue). Skinned the new Allied Races frame. Skinned a few more tutorial frame close buttons. Skinned the Expand/Collapse buttons on various frames. Skinned the reward and bonus icons on the PvP Skin. Skinned the reward icons with a quality border on the quest skin. Adjusted the Flight Map's font to match the general media font (#306). Added the combat and resting icon texture from Supervillain UI and Azilroka. Changed the click needed to reset current session in the gold datatext from Shift+LeftClick to Ctrl+RightClick. Saved Instances will now show Raid Finder lockouts correctly and will also allow heroic dungeons to be shown. Updated the Quest and Upgrade Icon in the Bag module. Added Kin's Forging Strike to Raid Debuffs (for normal+ raids). Fixed position of the ElvUI Status Report frame (/estatus). Fixed issue updating npc titles on NamePlates. Fixed placement issue of name and level on NamePlates when "Always Show Target Healthbar" is disabled. Improved workaround for vehicle issue on Antoran High Command (credit: ls-@GitHub). The Style Filter action "Name Only" will also display the NPC title now. Sorted the Dropdown for Style Filters by Priority (rather than by Name). Skinned various tutorial frame close buttons. Added toggle option for the new handling of the "Unspent Talent Alert" frame. Added option to control the amount of decimals used for values on elements like NamePlates and UnitFrames. Added new "Quick Join" datatext. Added new style filter action "Power Color". Added options to hide specific sections in the Friends datatext tooltip. Added the ability to assign items to bags like in blizzard's ui to our big bag (toggle the bags and right click bag -> assign it). Added new command "/estatus" which will show a Status Report frame with helpful information for troubleshooting purposes. Fixed issue with missing border colors on some elements after a login or reload. Fixed issue in Chat Copy which made it unable to copy dumped hyperlinks properly. Fixed issue with arena frames displaying wrong unit in PvP Brawls. Fixed issue which caused the MicroBar position to be misplaced during combat. Fixed issue which caused the Color Picker default color button to be disabled when it should still be active. Fixed error when importing style filters via global (account settings). Fixed issue (#282) which prevented some Style Filter actions from taking affect. Fixed issue (#288) which caused items in the bag to not update correctly (after sorting). Fixed issue which caused the invite via Guild and Friend (non-bnet) datatext to not properly request an invite. Updated UnitFrame and NamePlate heal prediction based on oUF changes. Various tweaks and fixes to skins and skinned: Recap button & Warboard frame. Tweaked sorting in the Friends datatext so WoW is always on top. Updated some of the Priest, Monk, and Paladin Buff Indicator spells. Style Filter border color action now applies to the Power Bar border as well. Stacks on nameplate auras will no longer be hidden when they reach 10 or above. Added new style filter triggers "Is Targeting Player" and "Is Not Targeting Player". Added new style filter trigger "Casting Non-Interruptible". Added new style filter action "Frame Level". Added ability to Shift+LeftClick the Gold datatext in order to clear session data. Added visibility options to the bag-bar. Added visibility options to the microbar. Added a Combat-Hide option to role icons on party/raid frames. Added option to self-cast with a right-click on actionbuttons. Added "Desaturate On Cooldown" option to action bars. It will make icons black&white when the action is on cooldown. Changed the vehicle fix we put in place previously. It will only affect the Antorus raid instance now. You no longer need pet frames to see vehicles in old raids. Fixed issue with stance bar visibility when switching between specs. Fixed issue with aura min/max time left settings in style filter actions. Fixed position issue with the nameplate target arrow when portrait was hidden. Fixed issue where style filter trigger didn't always set the health color properly. Fixed issue which required the user to click "Okay" in the Color Picker before colors updated (this was locked down intentionally for performance reasons, but those issues have been resolved in a different way). Colors will now update as you click the wheel. Fixed a performance issue with bag sorting. Sorting should seem a lot smoother, especially for low end computers. Suppressed error that could happen when you received a whisper from a friend which WoW had not provided data for yet. Fixed issue which broke the Aura step in the install guide. Fixed a few issues with auto-invite relating to other realms and multiple friends from the same bnet account. Fixed a frame level issue with nameplates which caused them to bleed into each other when overlapped. Fixed issue which caused the version check for ElvUI and associated 3rd party plugins to get sent to the addon communications channel excessively. It will now send a lot fewer messages in total. Fixed issue which could cause the clickable area on nameplates to use an incorrect size. Fixed issue with healer icons in battlegrounds when multiple players had the same name. Fixed various issues with the Friend datatext relating to multiple characters or games from the same account. Cleaned up code in Friend datatext. Enhanced the display and sorting of the Friend datatext. Shortened the text displayed on the movement speed datatext. This is currently only affecting the English client, but can be modified for other localizations by changing the respective localization string. Clicking the Currencies datatext will now open the currencies frame in WoW. Updated RaidDebuffs filter and added a few from Tiago Azevedo. Removed alert and flash in chat tabs when chat history is displayed after a login or reload. Removed IconBorder texture on BagBar bag icons. Various font and skin tweaks. Skinned the "Unspent Talent Point" alert and positioned it near the top of the screen. Changed the default value of "Max Duration" for Target Debuffs to 0. Included the minimap location text font in the "Apply To All" option. Reverted a backdrop color change on the TradeSkill frame. Changed the name format used for the ElvUI nameplates. Previously it was "ElvUI_Plate%d_UnitFrame" and now it is "ElvUI_NamePlate%d". Added visibility settings to the Stance Bar. By default it will hide in vehicles and pet battles. Added options for Combat Icon on the player unitframe. Added options for Resting Icon on the player unitframe. Added options for Health font on NamePlates. Added option to copy a single chat line by clicking a texture on the left side of it. Added raid debuffs for the new Antorus, the Burning Throne raid. This requires testing and feedback by users. Fixed issue with Style Filter scale action. Fixed pet type in the pet battle UI for non-English clients. Fixed pet type in tooltip for non-English clients. Fixed issue with nameplates not updating correctly when leaving a Warframe vehicle. Fixed issue with chat history showing incorrect name on messages from BNet friends. Fixed issue which caused auras to not respect the Max Duration setting when priority list was empty. Fixed issue which may have caused weird behaviour with player nameplate hide delay. Fixed issue which caused some Quick Join messages in chat to be duplicated. Fixed issue which made it impossible to target raid members in vehicles in the new raid instance. This is a temporary workaround until Blizzard fixes the issue. Until then you need to use Raid-Pet Frames if you need to see vehicles (Malygos, Ulduar etc.). Various tweaks/updates to a lot of the skins. Various code clean-up by Rubgrsch. Made sure Style Filters can handle alpha with flash action. Moved datatext gold format option into the "Currencies" tab. Raid icons will now be displayed as text in the Copy Chat window so they can be copied correctly. Holding down the Alt key while scrolling in the chat will now scroll by 1 line. Changed Ace3 skin to no longer add border on SimpleGroup widgets. The Quest Choice skin is now enabled by default. Added option to show Quick Join messages as clickable links in chat. Added option to change duration text position on nameplate auras. Added option to change castbar icon position on nameplates. Added font outline option for the Threat Bar. Fixed issue with nameplate scale not following Style Filter settings on target change. Fixed issue with placement of microbar within its mover frame. Fixed issue which caused player unitframe to bug out when entering invasion point while in a Warframe. Fixed error when setting text color on custom buff indicators. Fixed issue preventing you from inviting people on remote chat in Guild datatext. Fixed issue which caused classbar to disappear from target nameplate. Fixed issue which caused enemy nameplates to break after having targeted a friendly unit in an instance and have the classbar appear above that nameplate. Added Beacon of Virtue to Buff Indicator filter. Changed default fonts on NamePlates to PT Sans Narrow. Changed "XP" to "AP" on the Artifact DataBar. Added more game clients to the Friends datatext. Skinned the "Skip Cinematic" popup frames. Added a separate skin setting for Blizzard Interface Options. Changed Loot Frame mover to always be visible when movers are toggled. Fixed error in castbar element (for real this time). Fixed error in castbar element. Fixed issue creating new style filters. Added "Match SpellID Only" option to individual RaidDebuff Indicator modules. If disabled it will allow it to match by spell name in addition to spell ID. Added possibility of setting alpha of the stack and duration text colors on RaidDebuff Indicator modules. Added global option to choose which filter is used for the RaidDebuff Indicator modules. This is found in UnitFrames->General Options->RaidDebuff Indicator. Added new "CastByNPC" special filter for aura filtering. Added talent triggers for nameplate style filters. Added instance type triggers to nameplate style filters. Added instance difficulty triggers to nameplate style filters. Added classification triggers to nameplate style filters. Added option to hide Blizzard nameplates. If enabled then you will no longer see nameplates with the default Blizzard appearance. This option can be found in the NamePlate General Options. Added font options for the duration and stack text on nameplate auras. These options can be found in the "General Options -> Fonts" section. Added alpha action to nameplate style filters. Added "name only" action to nameplate style filters. Added flash action to nameplate style filters. Added tick width option to player unitframe castbar. Added tick color option to player unitframe castbar. Added "Auto Add New Spells" option to actionbar general options. Added "German Number Prefix" to the "Unit Prefix Style". Added Power Threshold trigger to nameplate style filters. Added ability to match players own health in the "Health Threshold" trigger for nameplate style filters. Added role icons to the RaidUtility frame when in a raid. Attempt more fixes towards the unit errors on nameplates. Fixed a divide by 0 error in Artifact DataBars. Fixed issue which broke stealable border color on unitframe auras while in a duel. Fixed issue which broke item links and icons in the profile export when using table or plugin format. Fixed issue with position of detection icon on nameplates when using "Name Only". Fixed issue with healer icon position when portrait is enabled on nameplates. Fixed issue which caused the "Hide" action on nameplate style filters to incorrectly show hidden nameplates if "Hide" was disabled. Fixed issue with portrait position on nameplates when healthbar is disabled but forced to be shown on targeted nameplate. Fixed issue with chat editbox position when backdrop was enabled/disabled. Added and updated spell IDs in the RaidDebuffs filter. Added Veiled Argunite to the Currencies datatext tooltip. Replaced more Blizzard font elements for panels where fonts were mixed. Various skin fixes and tweaks. Added stealable border color on nameplate auras. Changed default position of role icons on unitframes so they don't overlap with name. Moved "Reset Filter" button in the Filters section and added requirement of an additional click to execute. Renamed "Number Prefix" option to "Unit Prefix Style". Changed the default value for "Unit Prefix Style" from Metric to English. Optimized handling of events for the nameplate style filters to reduce performance impact. Added new library LibArtifactPower-1.0 by Infinitron. We will use this to improve AP calculations. Added possibility of hooking into style filter conditions. Fixed a few font elements on Blizzard panels that were not getting replaced with chosen ElvUI font. Added skin for the CinematicFrameCloseDialog frame. Added skin for the TableAttributeDisplay frame. Added some additional spells to the RaidDebuffs and RaidBuffsElvUI filters for M+ dungeons. Added quest boss trigger to nameplate Style Filters. Added a new default filter named "RaidBuffsElvUI". Meant for buffs provided by NPCs in raids or other PvE content. Both for buffs put on enemies and players. Added a "Reset Aura Filters" button for all Buffs, Debuffs and Aura Bars modules on both nameplates and unitframes. This will reset the Filter Priority list to the default state. Added a "Reset Filter" button to all default filters in the Filters section of the config. This will completely reset the filter to its original state and remove any spells the user added. Added 2 new special filters for Aura Filtering: "CastByPlayers" and "blockCastByPlayers". These can either allow or block all auras cast by player units (meaning not NPCs). Fixed taint which prevented kicking someone from guild. Fixed rare error in nameplates when changing target. Fixed issue which may have caused some nameplate elements to stay visible when nameplate was not. Changed how we control state of filters used in filter priority lists. Now you use Shift+LeftClick to toggle between friendly, enemy and normal state on a filter. Tweaked default settings for aura filter priority lists based on feedback from users. Removed caching of HandleModifiedItemClick to allow hooks to fire from other addons. Fixed spell ID for Consuming Hunger in the RaidDebuffs filter. Added "Class" to Style Filter triggers. You can select which classes and specs this filter should activate for. Your current class and spec has to match this before a filter is activated. If no spec is selected then it will only match class. Fixed issue which broke the Ace3 config of other addons. Reverted some changes to Profiles section of ElvUI. MAJOR: Added "Style Filters" to NamePlates, allowing you to perform various actions on specific units that match your chosen filter settings. MAJOR: Added a new aura filtering system to NamePlates and UnitFrames. This new system is much more advanced and should allow you to set up the filters exactly how you want them. Added enhanced target styles for NamePlates. A cool glow and arrows have been added, along with the ability to change their color. Added mouseover highlight to the NamePlates. Added Portrait option to NamePlates. This was also added as an action in style filters. Fixed an error when entering combat while game is minimized. Fixed error when switching profile while having player unitframe disabled. Updated a lot of skins. Updated RaidDebuffs filter with more ToS debuffs. Default chat bubbles can now use the ElvUI chat bubble font unless it was disabled. Removed "Hide In Instance" option for chat bubbles. The ElvUI logo has been updated with design by RZ_Digital. The default color in ElvUI has been changed to match the new logo. Disabled "Text Toggle on NPC" by default, as it caused confusion for new players. Restructured the UnitFrame sections of the ingame config. It now uses tabs instead of the often overlooked dropdown. Added shortcut buttons to the ActionBars and UnitFrames main pages. Added Drag&Drop support to AceConfig buttons for our new aura filtering system. Fixed error when having Masque enabled but having ElvUI skinning disabled within Masque settings. Fixed "script ran too long" error when jumping from Skyhold to Dalaran. Fixed a few "attempt to access forbidden object" errors relating to tooltip. We can't fix them all, Blizzard need to step in here. Fixed error in reagent bank caused by trying to index a missing questIcon object. Invalid tags on unitframes will now display the used tag text instead of [invalid tag]. Units in different phases will now always have their unitframe be displayed as out of range. Various skin tweaks and fixes. Fixed issue with display of interruptable / non-interruptable colors on the unitframe castbars. Fixed issue with display of total cast time on the player castbar when crafting multiple of the same item. Fixed issue which caused ElvUI to re-enable chat bubbles when the user had disabled them in Interface Options. Alerts created by other addons (using the WoW alert system) will now follow the growth direction shown on the Alert Frame mover. Fixed issue which prevented ready check icons from displaying correctly. Fixed issue which broke coloring of Runes. This is for developers of plugins for ElvUI. With the oUF update some elements have been renamed. This means your references to these elements need to be renamed in your code too. Please see http://www.tukui.org/forums/topic.php?id=39605 for more info. Fixed issue which prevented the classbar from showing partial soul shards for destruction warlocks. Various skin tweaks by Merathilis. Updated the unitframe framework "oUF" to latest version. Blizzard has made chat bubbles in dungeons and raids protected, meaning we cannot modify them at all. This means chat bubbles will have the default look while you are in a dungeon or raid instance (Garrison included). There is nothing we can do about this, addons are no longer able to modify them under those circumstances. Fixed error when mousing over the Order Hall datatext. Prevent weird error in cooldowns. Fixed some tooltip taints brought on by patch 7.2.5 changes. Fixed issue which broke "relic" search keyword. Fixed issue which could cause an invisible frame to block clicks when the minimap was moved out of the topright corner. Fixed AP calculation for items with very high values for Asian clients. Fixed unitframe range check for demonology warlocks between lvl 10 and 13. Simplified skinning of chat bubbles with new API. Disabled ElvUI modifications to the WoW error frame until it can be re-coded to work with patch 7.2.5 changes. Added callback system for ElvUI modules in order to preserve stack trace when an error occurs. Fixed some issues with the updated Objective Tracker skinning. 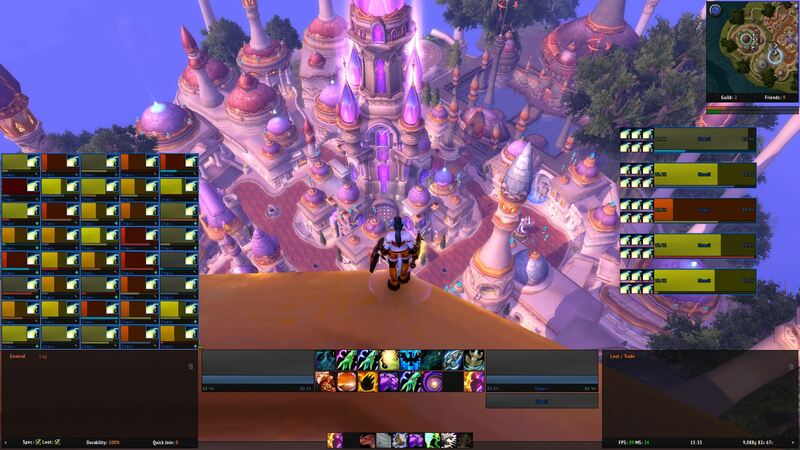 Fixed issue which prevented some broker addons from being available as datatext in ElvUI. 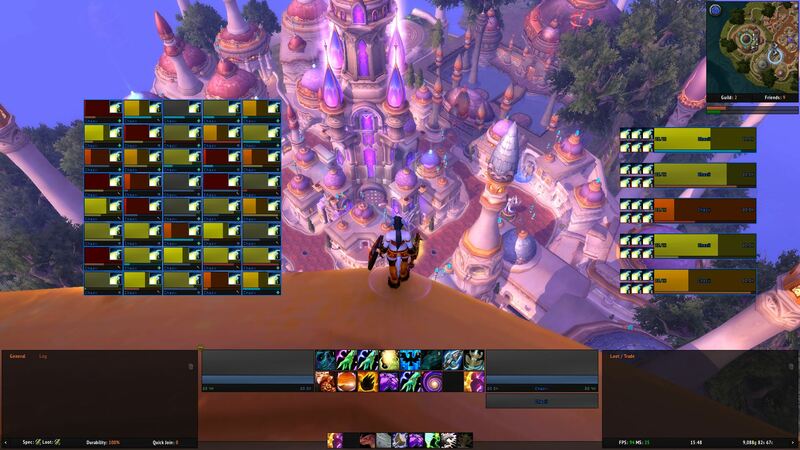 Fixed AP calculation in bags when Colorblind Mode was enabled in WoW. Added options for the Ready Check Icon on Party/Raid/Raid-40 Frames. Fixed display of the rep DataBar for paragon factions. It will now correctly count from 0. Fixed issue which caused the unitframe border color to not stick through a reload/relog. Fixed issue with AP calculation in bags for items which granted less than 100 AP. Fixed issue with Masque Support on Buffs/Debuffs which caused stack text to disappear. A few skin fixes by Rubgrsch. A lot of skin tweaks/fixes by Bunny67. Added Cyrillic support to the Expressway font. Added Prestige level to the Honor DataBar tooltip. Removed requirement to hold down Shift in order to move the Interface Options frame. Added a separate "Border Color" option for UnitFrames. Prevent error in tooltip when changing spec while mousing over something. Fixed issue which prevented item borders in bags from updating when opening the bank. Fixed issue which prevented item buttons in bank from updating on first show. Fixed a potential error in the oUF stagger element by adding a fallback value. Fixed an issue which caused the power:max tag to display an incorrect value. Fixed a display issue with the honor reward icon at certain prestige levels. As a downside it will not look as crisp as it used to. Fixed AP calculation in bags for Korean and Chinese clients. Fixed display issue with the Micro Bar. Fixed issue with AP calculation in bag. It should now find items that it previously did not. Fixed a division by zero error in the Reputation DataBar. Fixed issue which prevented Mythic Keystone from being sorted. Skinned the new Contribution frame. Added new Time Release spell IDs to RaidDebuffs filter. The Artifact DataBar tooltip will now display numbers in groupings (1.000.000). Fixed error when trying to import invalid profile table. Fixed issue which prevented actionbutton icons from updating. Fixed error caused by attempt to skin non-existent options for Mac. Fixed the "Darken Inactive" setting for stance bar. The friendly nameplates in dungeons and raids are currently broken. While in a dungeon or raid instance the default WoW nameplates are supposed to be active. Unfortunately this is not the case when the ElvUI NamePlates module is enabled. There is no easy fix for it, as the issue is with how the nameplate module was initially written. For the time being you will have to either play without friendly nameplates in those situations, or disable the ElvUI NamePlates module and use a dedicated addon for NamePlates. We apologize for the inconvenience. Implemented changes to support the new patch 7.2. Made various skin tweaks according to latest FrameXML changes. Enhanced the code which calculates Artifact Power in bags for the Artifact DataBar. Added a "Size Override" option for individual spells in the Buff Indicator filters. Added a font outline option for chatbubbles. Added a toggle option for auto-closing of the pet battle combat log. Added option to hide the nameplate powerbar when empty. Added option to hide the ElvUI Raid Control panel. Fixed an error that could happen when adding new spells to the Buff Indicator filters. Fixed non-relic keyword search. The "power" keyword will once again only find items that grant AP. Fixed friendly unitframe range check for resto druids. Fixed issue which caused raid icons on nameplates to not update properly unless targeted. Updated unitframe range check for druids to use spells that are learned earlier. Added some ToV debuffs to the RaidDebuffs filter. Added new visibility options for the Player NamePlate. These options should function the same regardless of whether or not you have "Use Static Position" enabled. Added ClickThrough options for Personal, Friendly and Enemy type nameplates. They can be found in the NamePlates General Options. Added "Current - Percent (Remaining)" text format option for DataBars. Added font and font-outline options to DataBars. Added font-outline option to tooltip healthbar. Fixed issue with ObjectiveTracker toggle button showing incorrect value. Fixed issue which caused the Blizzard PartyMemberBackground frame to show up when it should not. Fixed "relic" keyword search in bags. Fixed AP calculation display issue for values over 1 million. Fixed issue which caused a mover to not respond to a "reset" immediately if it had been enabled/disabled through E:EnableMover or E:DisableMover. Fixed error when trying to import a profile from another addon (Vuhdo for example). ElvUI will now handle the error gracefully and inform you that the import string is incorrect. You can now open a sub-section of the ElvUI config directly through the /ec command. This requires that you supply the path to the config page as a comma-separated list. The path needs to match the table structure of the config exactly (in code, not as displayed ingame). Example: "/ec unitframe,player,portrait". Added E:IgnoreCVar(cvarName, ignore) API. This can be used to tell ElvUI that it should not automatically change a specific CVar which had previously been locked in place by ElvUI. Inverted heal absorb display and removed option to change it. Added heal absorb display to the heal prediction module. Color can be changed in the UnitFrames section of the config. Added option to control heal prediction overflow. This will allow the textures to grow past the health border. Added option to invert heal absorb display. This will make heal absorb cover a portion of the health instead of extending it. 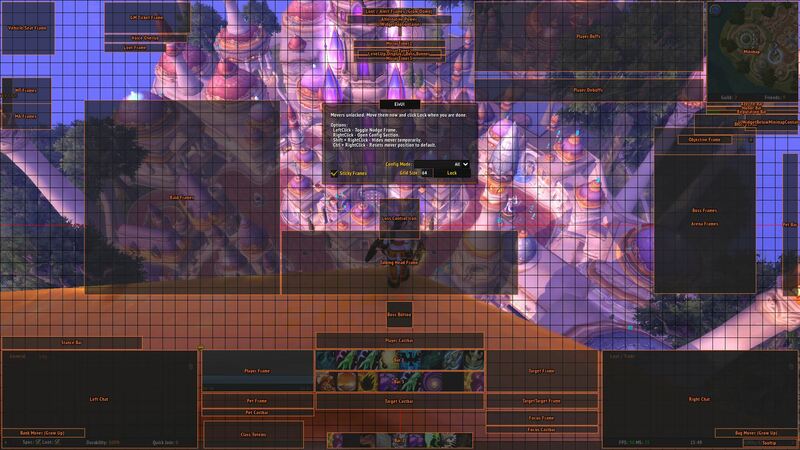 Fixed error when opening fullscreen worldmap while in combat in the Order Hall. Fixed width of nameplate auras when not using Thin Border style. Fixed issue which prevented upgrade icons from Pawn to show on items in bags. Added display of upgrade icon in the skinned version of the default bags. Renamed "Class Bar" in the General section of the config to "Class Totems" to avoid confusion. Fixed unitframe range check for new warlocks below lvl 13. Added support for up to 10 combo points on the player unitframe class bar (Rogues). Updated all used libraries to latest versions. Fixed issue which caused editbox position to not update correctly when changing profile. Fixed issue which caused AFK mode to not update correctly when changing profile. Fixed issue which may have allowed the AFK screen to re-appear after the option was disabled. Fixed a compatibility issue with DejaCharacterStats addon. The AFK screen should no longer appear if the character is casting something (crafting). Fixed error in Garrison skin when the addon GarrisonCommander was enabled. The DPS datatext will no longer count overkill damage. Both DPS and HPS datatexts now uses ShortValue for formatting.